As part of the Disney Parks Blog ongoing “Room With A View” series, I’m giving you a taste of what it’s like to stay among the glitz and excitement of showbiz, dahhling! 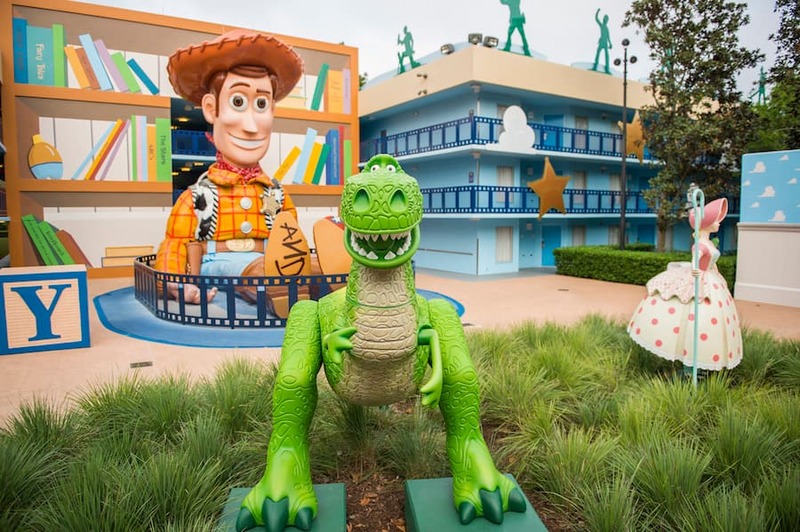 Of course, I’m talking about Disney’s All-Star Movies Resort, where you’re immersed in larger-than-life décor from some of the most beloved Disney movies. 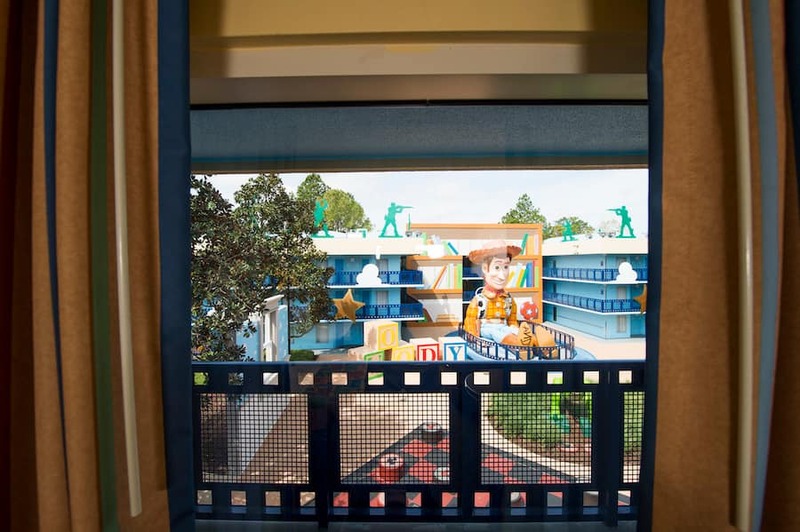 I took a peek in room 0901, part of the Toy Story wing of the resort, and felt like I was stepping behind-the-scenes. 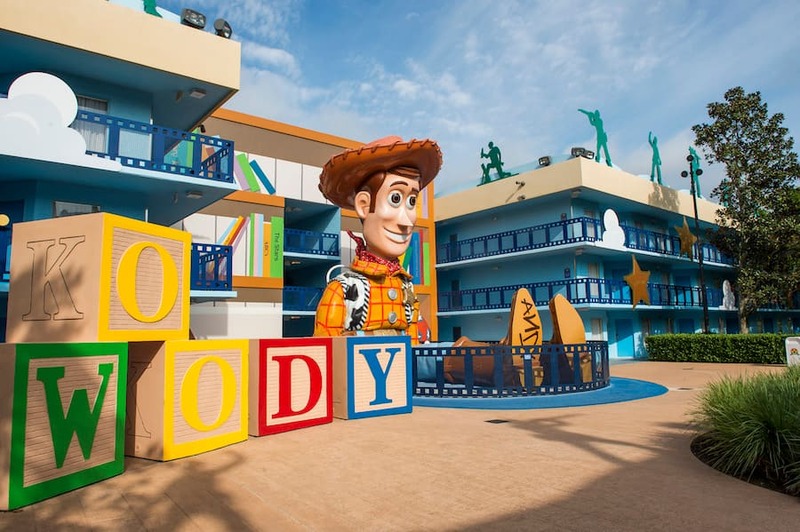 Just outside the window, there’s a perfect view of Sheriff Woody keeping a watchful eye and making sure all of his fellow toys are having fun. 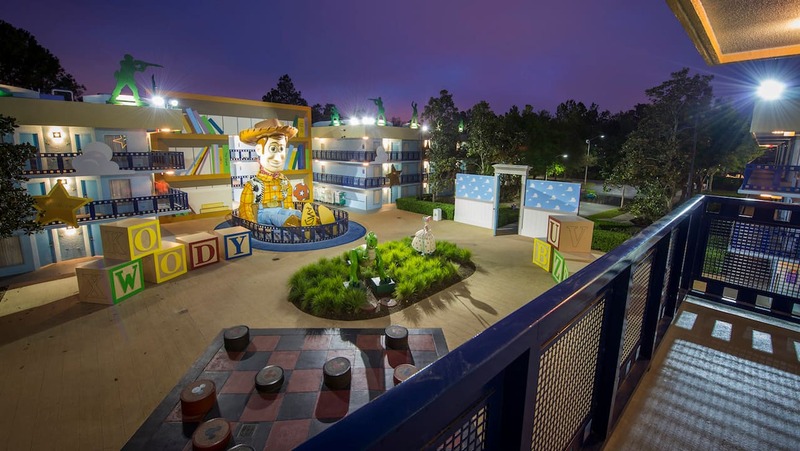 It’s the perfect fit for families with kiddos who love Toy Story, as Rex, Bo Peep, an army of toy soldiers, and Buzz Lightyear are all right outside in the courtyard. Special touches inside the room harken back to Hollywood, with images of Minnie Mouse, Mickey Mouse and Pluto directing a film, movie-star vanity lights, and film reel tiles. There are two comfy double beds to provide some beauty rest, and a table and chairs and the TV keep the entertainment going. 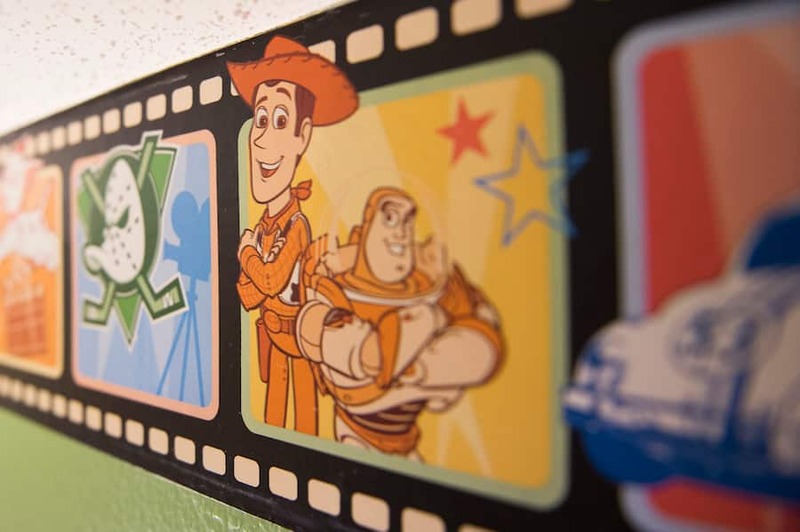 Woody and Buzz, along with other favorite characters from Disney films, also can be seen the wallpaper border. 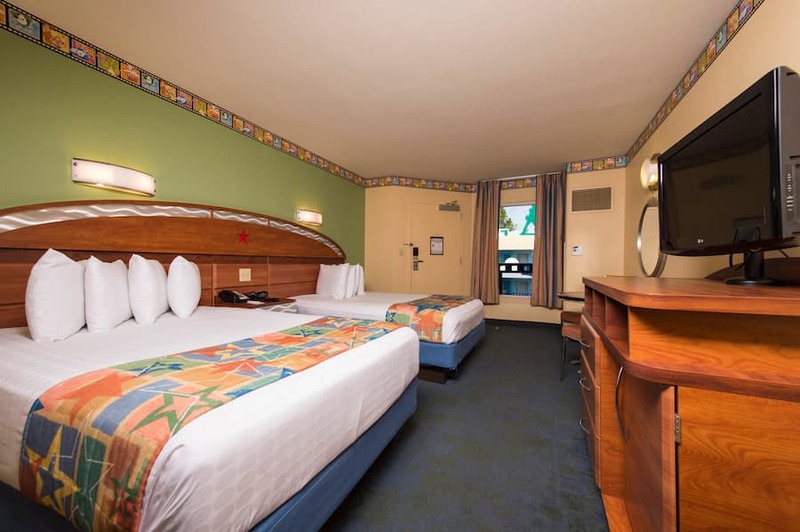 We stayed in pretty much that same section on our last trip to Disney in 2014 and I loved the rooms. We really enjoyed walking around in Andy’s Room and interacting with all the really fun scale toys. It was clean and bright. The staff was great and our room was on the end by the road so it was fairly quiet but still close to everything. I would definitely consider going back. Happy to hear you and your family had a fun time, Michele. Isn’t Andy’s Room area awesome? Stayed there in the Toy Story area for 3 weeks last September. I find it hard to find fault with the hotel and the amenities. All staff were great, everywhere was clean and the evening outside movies where a nice way to relax. 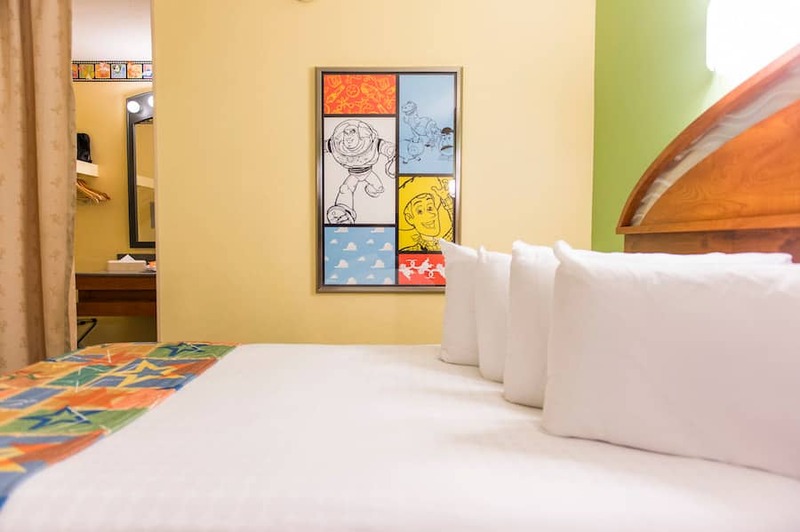 I love the idea of staying here or Art of Animation, but there is no way 2 double beds are anything but uncomfortable for a family of 4. And I have a 4 and 8 year old. Why would they not put queen beds in these rooms? 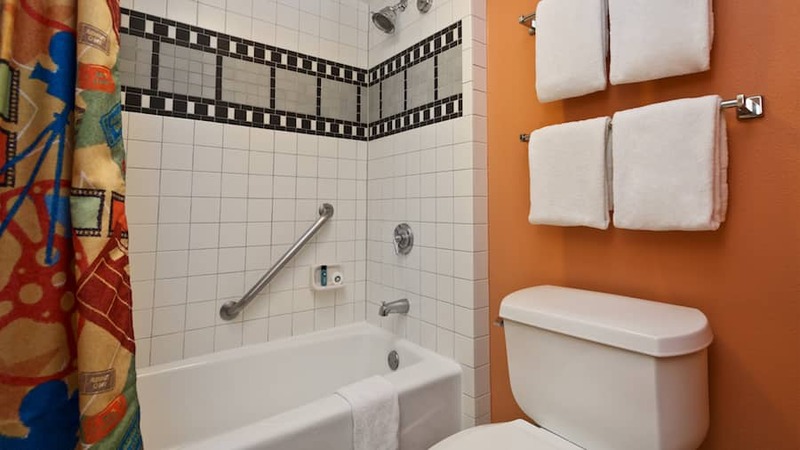 We would need 2 rooms or a suite and then you might as well stay in a moderate hotel. Such a shame. Staying for the first time in May! They may be “motel” accommodations done Disney compared to the fancier resorts, but anyone who remembers staying at a motel on a long family road trip knows the thrill of going out the door to the outside first thing in the morning, setting right out for the fun stuff, and getting back for the pool in the afternoon. Here, we’re surrounded by Disney right from that moment out the door, which makes it feel like part of rushing for that breakfast and bus. One month until we check in for a week! I think my kids will love this place! 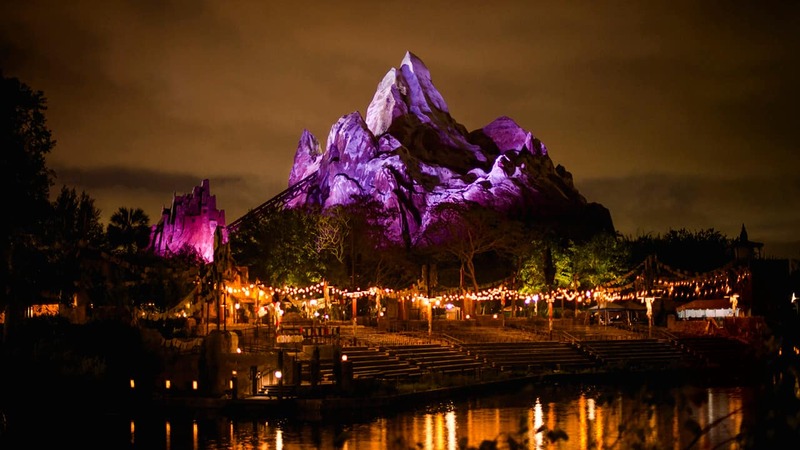 It’s great that Disney has affordable properties for families who have a smaller budget, but still want to be fully immersed in the magic! I just finished staying here in December 2015. Pretty nice place for the price. Especially for those who have children and want to stay at an affordable location on Disney Grounds.